Today I want to share with you an easy craft tutorial. I call these my citrus themed glass plates. Before my 4oth birthday party, I had been scouring the stores for some pretty citrus colored plates to serve sweets on. I was coming up empty-handed, was running out of time, and was concerned about my budget. I happened to stumble upon some glass plates I bought at Goodwill awhile ago. And then the idea hit me! Why not make my own decorative plates! 1. Clean the bottom of the glass plates with glass cleaner. 2. Trace around the plate on the scrapbook paper. 4. Snip four slits into the circle but NOT all the way to the center. 5. Snip four more slits centered between the first set of slits. You should end up with eight cuts equally spaced. 6. 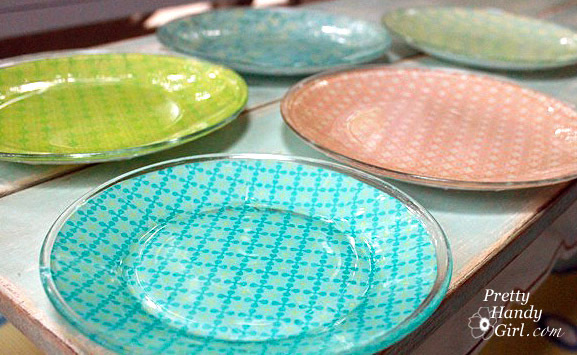 Cover the bottom of your glass plate with mod podge. 7. Center the cutout circle onto the bottom of the plate, pattern side down. Gently press the paper onto the plate allowing the paper to overlap slightly at each slit. 8. Liberally apply mod podge over the scrapbook paper. 9. Use your finger to smooth out the wrinkles in the paper. But, be gentle or the paper will tear. 10. Lay the plates upside down on the jars and cans until dry. Add more mod podge if needed to seal the scrapbook paper and glue it down. Turn them over and enjoy your unique decorative plates. Note: Do not fully submerse the plates in water, wipe them off and wash the tops so as not to mess up the paper side. Stack them with a paper towel in between so they don’t stick together. Load them up with some light citrus sweets and they will be the hit of the party! The possibilities are endless with these plates. Think about personalizing them with photos or monograms. What are your ideas for making your own plates? I wonder if you could use a decorative cloth in place of the paper? I have a beautiful piece of fabric that would look great in this project. Might it work? Maybe I’ll just try it…..
Patti, I bet it would work, especially if the fabric is thin. Wondering if you could use the same plates, soak off one seasonal paper and reapply another seasonal paper? Just wondering if you could soak off one seasonal paper and reapply another seasonal paper? So much cheaper than buying dishes for each holiday or event. Renee, you could try, but it might be a lot of work for each season. Can’t wait to try it. The holidays are coming up and this crafty idea will be well used (and enjoyed)! Very cool idea! I just made my own glasses and was looking for a plate idea. Thanks for sharing! Eu uso guardanapos de papel, só uma das 3 faces, a mais colorida, e cola para decoupagem e depois verniz para artesanato. Uma mão de cola, coloco o guardanapo, como você colocou o papel, espero secar. Mais uma mão de cola em cima do guardanapo. Deixa secar. Eu ainda coloco mais uma mão de cola bem fina, antes do verniz. Pode lavar a vontade, não estraga, e fica muito lindo, dá impressão de pintado. Se quiser posso mandar fotos por e-mail. Abraços – Andréa Marra, Ponta Grossa, PR, Brasil. Hi there, I keep trying this project but I get lot of cloudy spots and I rub out and smooth it out 🙁 any tips u can give me????? Hi there, I keep trying the modge podge on clear plats but I keep getting cloudy spot I different shapes 🙁 so they don’t look pretty like urs, I smooth out bubbles. So I don’t know what I’m doing wrong. Do u have any suggestions???? ?